The Schlage Sense Wi-Fi Adapter lets you lock/unlock your Schlage Sense Smart Deadbolt from anywhere with your Android smartphone, iPhone, iPad, or iPod touch. Simply plug the small Wi-Fi Adapter into power at home. Use the Schlage Sense app to pair it with your deadbolt and connect it to your home Wi-Fi network for anywhere access. Schlage Sense Wi-Fi Adapter must stay plugged into power at home, connected to Wi-Fi and in Bluetooth range about 40 ft. from the lock to enable remote access. 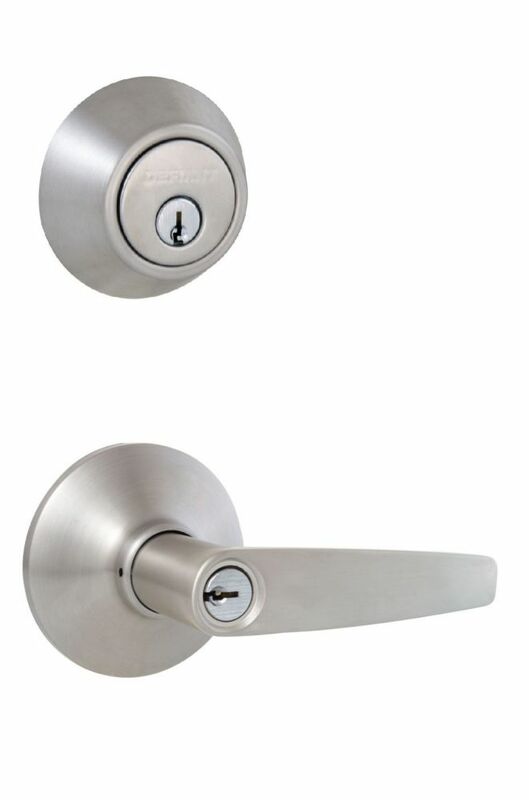 Olympic Stainless Steel Single Cylinder Entry Lever Door Combo Pack Featuring a Lifetime Guarantee, DEFIANT<sup></sup> meets or exceeds ANSI Grade 3 Standards for residential use. This lock features a drive in latch with an adjustable backset and optional radius cut faceplate . Locks can be re-keyed to fit your existing KW1 keyway. The Powder coated finish will provide years of durability. When used as a replacement lock only a screwdriver is need to make installation a snap.